Playa del Faro is the perfect brew of sun, sea and natural beauty. Clinging on the southernmost municipality of La Palma, the beach comes with pebbles and the island’s signature volcanic black sand. Watching over it is a stunning landscape featuring rocky surfaces topped off with a lot of hike-friendly volcanoes. Soaring sea cliffs cradle the beach giving a more isolated feel to Playa del Faro. It also features two interesting lighthouses, one of them dating back to the early 20th century. As serene as it can be, the waters are particularly warm and calm on most days. Beneath the surface, scuba divers feast in the interesting underwater sights and ochre-colored seabed. In addition, the beach is not only convenient for cars and buses, it can also accommodate disabled visitors. Despite its popularity, El Faro has maintained itself blissfully secluded from the hustle and bustle of the city life. Playa del Faro is a part of the Volcanoes of Teneguia National Monument for many good reasons. One is the spectacular beauty of its 75-meter-long beach which mesmerizes visitors the moment they arrive. Featuring a calmer side of the vast Atlantic Ocean, Playa del Faro offers safe and fun water activities for the whole family. Near the lighthouses and because of the moderate waves, it is perfect for a refreshing dip. Afterward, visitors can lie under the sun and catch a tan among the colorful fishermen’s boat. The southernmost tip of the island features some of the most eerily beautiful dive sites. Explore an underwater graveyard with 40 crosses known as Las Cruces de Malpique. This marvel is a tribute to the Forty Martyrs of Brazil in the 16th century. For more experienced scuba divers, the Torre de Malpique, with a depth of 40 meters, presents a challenging dive. These dive sites are part of the UNESCO Biosphere Reserve and are a hit among night diving enthusiasts and underwater photographers. 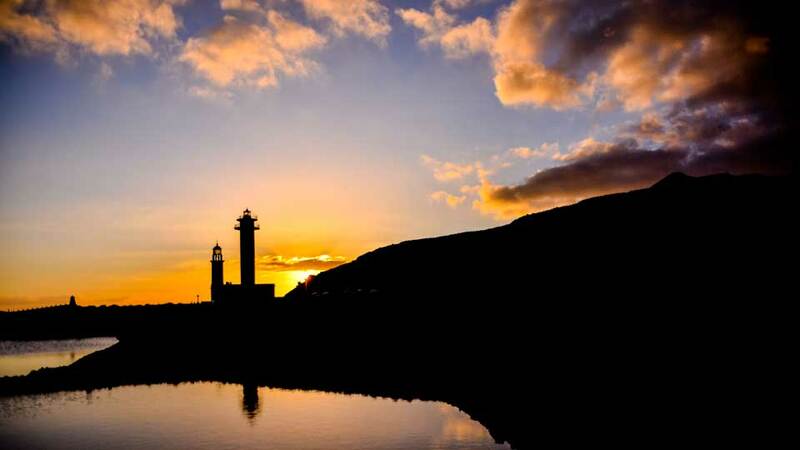 Playa del Faro’s location on the southeastern part of the island means that sunsets here are not to be missed. Stay a little longer after your water adventures and witness the absolute magnificence of the sun kissing the Atlantic Ocean goodbye. The view of the glimmering sea contrasting with the red and orange horizon is simply more stunning than any camera can capture. The Fuencaliente Lighthouses mark the southern end of La Palma. The first tower which was opened in 1903 now houses an interpretation center for the marine reserve on the island. It aims to promote respect and understanding on the marine environment. Meanwhile, the newer of the two towers sports an eye-catching red and white color. Opened in 1985, this lighthouse can be seen from as far as 14 nautical miles. Standing adjacent to the old tower is a concrete cross known as the Monument for the Martyrs of Brazil. In 1570, the ship of the Brazilians was attacked and captured by a fleet of French pirates. In memory of the victims, their names are engraved on the cross. Meanwhile, the seabed in Fuencaliente also has 40 crosses to pay tribute to the Brazilians. Another point of interest that visitors should not miss is the Fuencaliente Salt Fields. This hugely valuable human landscape combines earth, air, and water that form the salt fields. Nature’s color palette paints this labyrinth-like salt fields, from yellow to blue passing through hues of pink. The final products, which are small crystals collected by hand, are formed into small pyramids by the locals to dry up. 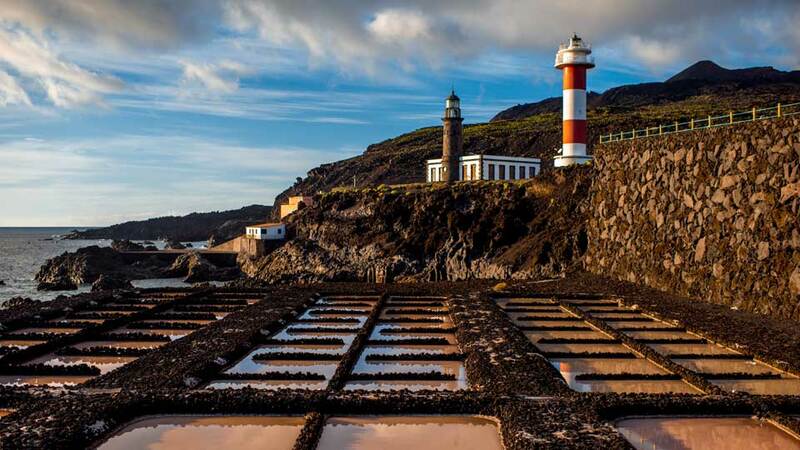 Declared an Official Site of Scientific Interest, this salt field is one of the most visited in all of La Palma. All the splashing fun in the waters and times spent lazing on the beach will surely get visitors starving. It’s a good thing that Playa del Faro features a well-rated restaurant that is also the best in town. For more options, there are also a few must-try bistros just a short drive away. Perched on the edge of a cliff next to the two lighthouses is El Jardin de la Sal. As such, this excellent restaurant not only boasts modern-looking interiors but also charming ocean-side vibe. Their local and international cuisines are delights to the taste buds, especially the seafood dishes and desserts. All these, plus a glass of delicious local wines, can be savored on the second-floor patio. Here guests can feast on their meals while taking in the unobstructed views of the Atlantic Ocean and the salt fields. 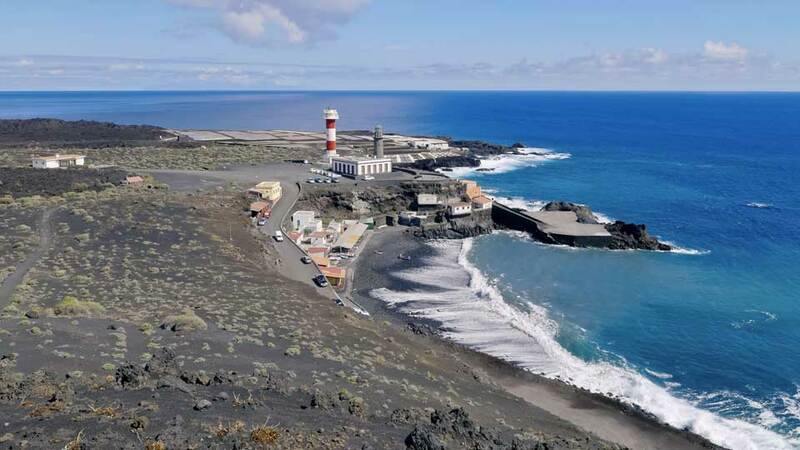 Although located in a pretty isolated coast off the tip of La Palma, visiting Playa del Faro is easy. This is all because of the excellent network of highways as well as the strategically-located bus stops spread across the island. For visitors driving on their own from the municipality center, the journey should not be more than half an hour. They may enjoy a smooth drive through LP-207 motorway, passing through the stunning landscape of the Teneguia Volcanoes. Upon arrival at the beach, there is a security-camera equipped car park that can cater to over 30 small to medium-sized vehicles. Meanwhile, another option is to take the reliable public bus transport from Los Canarios. The Bus Route 203 leaves every two hours daily and the estimated travel time is 35 minutes. Get off at El Faro bus stop which is just a stone’s throw away from the beach. Spending a couple of hours in Playa del Faro and the lighthouses, it’s easy to see why Fuencaliente de La Palma has chosen the area to be their icon. The beach embodies the whole municipality, accessible and convenient yet it has managed to maintain its tranquility. At this beach, time seems to stand still with its relaxed and serene atmosphere. Immersive experiences on the beach as well as beneath the ocean surface await each wandering soul. The remoteness and absence of city clamor are enough incentives for lovers of peace and nature. Even so, El Faro has not completely lost contact with the rest of the world with its excellent restaurants and highways. Having the benefits of an isolated gem without compromising accessibility, there is nothing more one can ask for when in this Fuencaliente piece of paradise.